Toward the end of the 19th century, 25 people from four different Chilean indigenous groups were kidnapped from Tierra del Fuego and Patagonia by a German businessman and taken to Europe to be exhibited as attractions in cities throughout the continent. THE HUMAN ZOO uncovers the history of this colonial spectacle, and follows the fallout into the present. 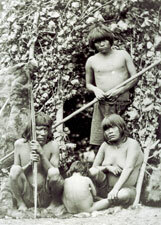 With Chilean historian Christian Baez, director Hans Mulchi contacts these native people's descendents, and traces their voyage from South America across Europe, paying particular attention to the fate of Calafate, a Selk'nam boy who was taken when he just 9 years old, and survived to return to his native land. Others were not so lucky. The filmmakers discover a collection of skeletons of five Kawesqar people in the archives of the Anthropology Department at the University of Zurich, and with help from the Swiss researchers, begin the process of repatriation to Chile. Their efforts-and those of the Kawesqar descendents-reveal not only the persisting legacy of colonial oppression, but also the fissures that still separate indigenous Chilean communities from their national government.